A rich assemblage of plants has evolved and diversified in New Zealand’s high mountains, where some grow wedged into rock crevices or anchored to scree slopes. 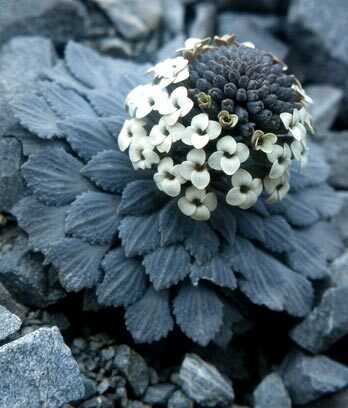 A fifth of New Zealand’s flowering plants – 500 species – grow exclusively in rugged, cold alpine environments. Alpine plants are special because they can live in low temperatures. There are about 1,000 native plants that can grow in the mountains of New Zealand, 500 of which are found in no other environment. The alpine zone is the area on a mountain between where trees stop growing (the timberline) and where permanent snow begins. About 11% of New Zealand is alpine land, including parts of the Southern Alps in the South Island, and the volcanoes in the centre of the North Island. Grassland vegetation contains mostly grasses, especially large, evergreen snow tussocks. Growing amongst these are shrubs such as hebes, and other flowering plants such as mountain daisies and buttercups. Wetland vegetation grows near mountain lakes, waterfalls and swamps, and includes mosses, rushes, and cushion-shaped plants. Stable rock communities grow on high mountain rock, and include ‘vegetable sheep’ – plants that have woolly-looking leaves to avoid drying out. Rock debris plants risk being knocked over by moving rock. To survive on unstable areas such as scree slopes, they are small, have fleshy leaves and deep roots. Alpine plants have adapted in different ways to survive low temperatures. Many are small and compact, but often have large white flowers to attract pollinating insects or birds. Some plants make chemicals to stop them from freezing. And some conserve energy by not reproducing every year. Animals introduced from overseas have had a harmful effect on New Zealand's native alpine plants. Mammals such as red deer and hares trample the vegetation and eat out the edible plants. Some introduced plants have invaded alpine areas and are considered weeds.